No-Bake Coconut Panna Cotta Tart ~ this refreshing no bake dessert is based on a silky coconut panna cotta and the fruit topping can be customized to whatever’s in season! 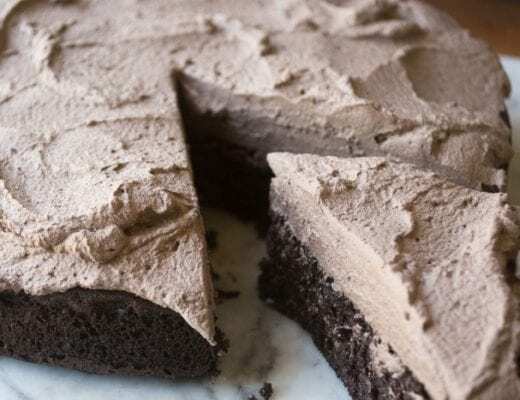 This has everything you want in a summer dessert. It’s light, cool and refreshing, not too sweet, with a silky texture and a subtle coconut flavor. Panna cotta is a new discovery for me. I like how it slips and slides on the tongue, and you can flavor it in a million ways. 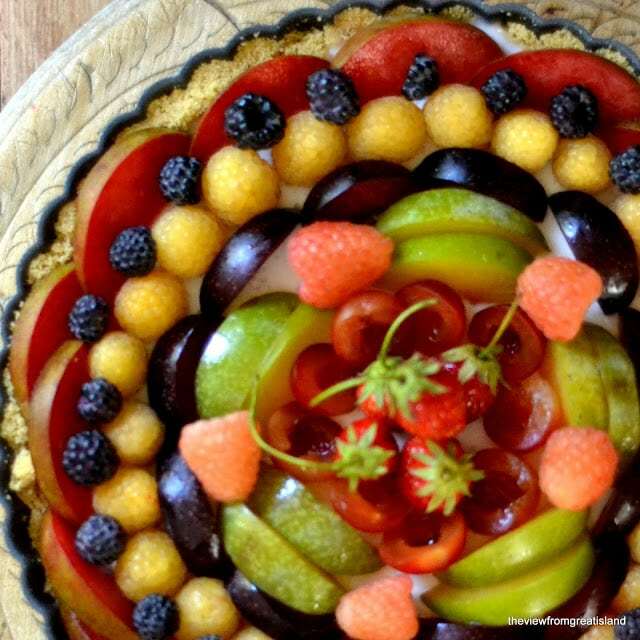 I went to town decorating this tart with all kinds of plums, pluots, and berries. That’s because I had a huge stash from last week’s farmer’s market. 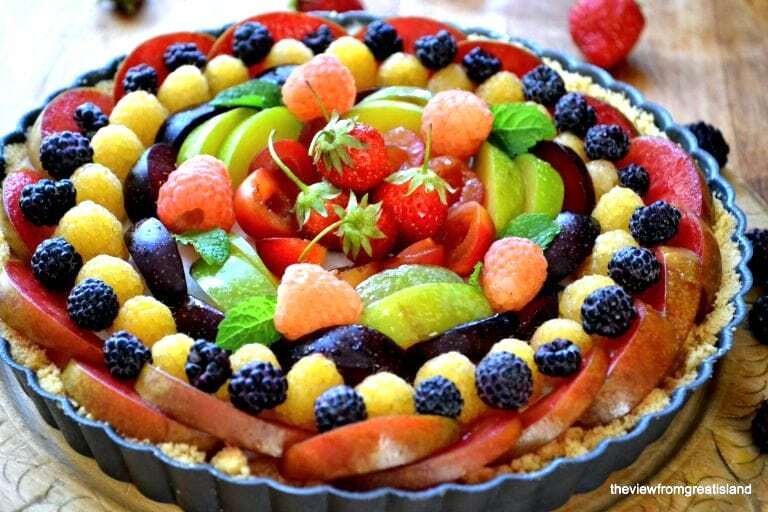 But this tart would be equally nice if you just covered it with one kind of fruit, like strawberries, raspberries, or peaches. 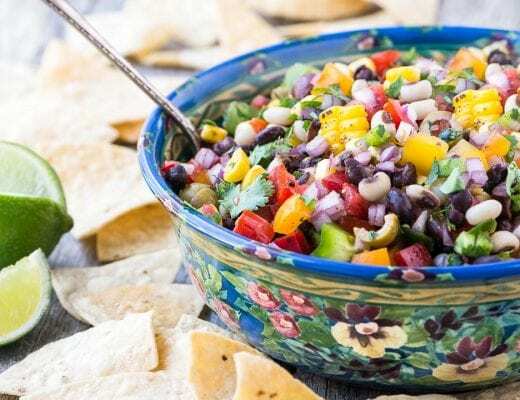 Look for good fresh flavor first, but after that, keep an eye towards nice color combinations. You can crush up any kind of cookie for the crust. I used simple lemon wafers, which turned out great because the lemon flavor went well with the coconut panna cotta. But chocolate wafers, or plain graham crackers would be fine, too. 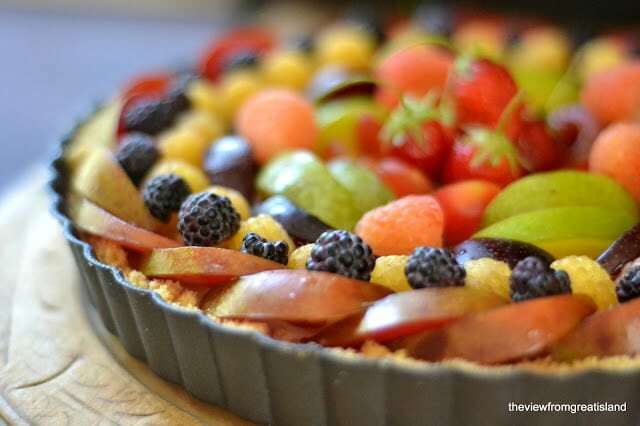 This is the sweet version of my Beautiful Breakfast Tart. I had a lot of fun arranging the fruit, and it’s not hard to do. You can be as precise or as rustic as you want. If you want to go for the colorful mandala look like I’ve done, it helps to start from the outside and work your way to the center, overlapping the layers a bit as you go. I’ve got a Pinterest board to give you inspiration for all kinds of looks. 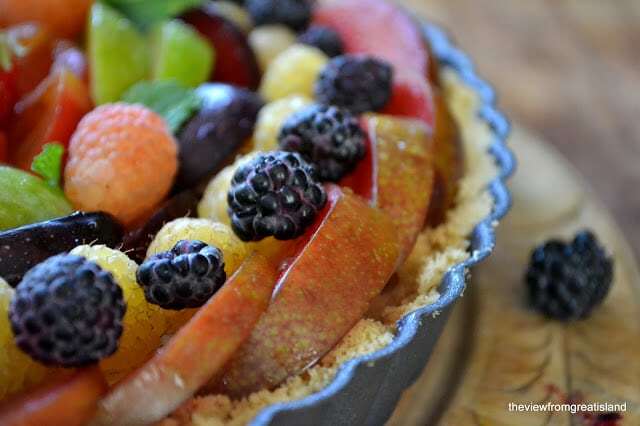 At the end you can fill in little blank spots with small berries and mint leaves. 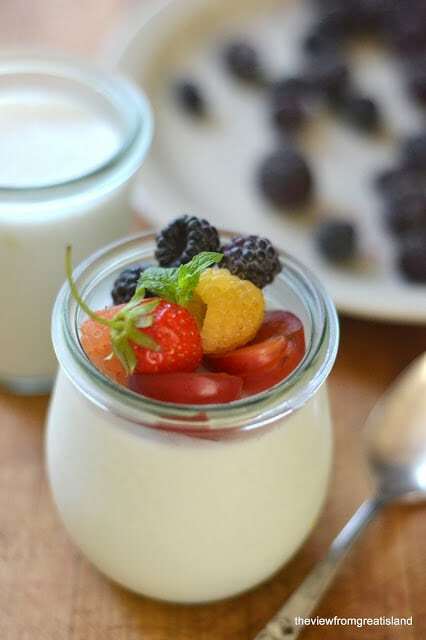 Pour any extra panna cotta into little individual jars and top with fruit. 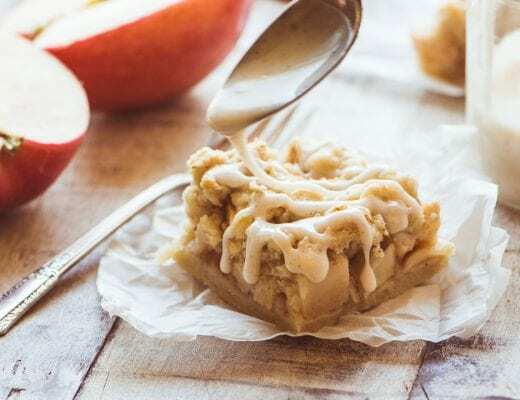 Come to think of it, you could also put the crust mixture at the bottom of these cups and recreate the whole tart in a cup. Smash or grind the cookies into very fine crumbs. Pour in the melted butter and mix thoroughly, until all the crumbs are moistened. Sprinkle the gelatin onto 1/4 cup water. Set aside. Heat the coconut milk and sugar just until the sugar dissolves. Add the vanilla and the gelatin. Stir well, making sure the gelatin gets completely dissolved. Cool slightly, stir to make sure it's mixed well, and then gently pour the mixture into the tart pan. If you have extra liquid, pour it into individual cups. Put it back in the refrigerator until the panna cotta sets up. This may take a few hours. 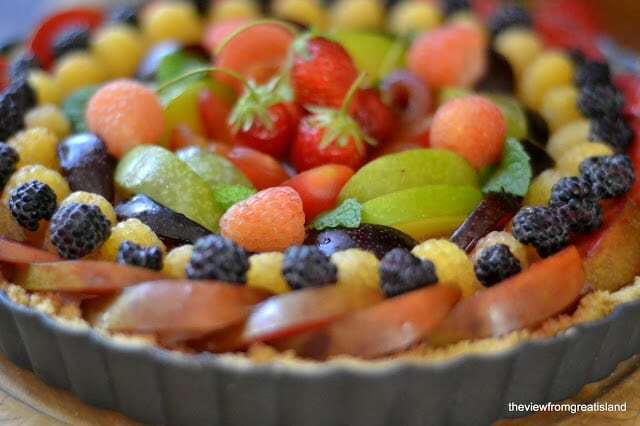 Decorate the chilled tart with fresh summer fruit. I used plums, pluots, and assorted berries. Dust with powdered sugar just before serving if you want. Keep refrigerated until ready to serve, but eat within a few hours of assembling the fruit, especially if you've used cut fruit. 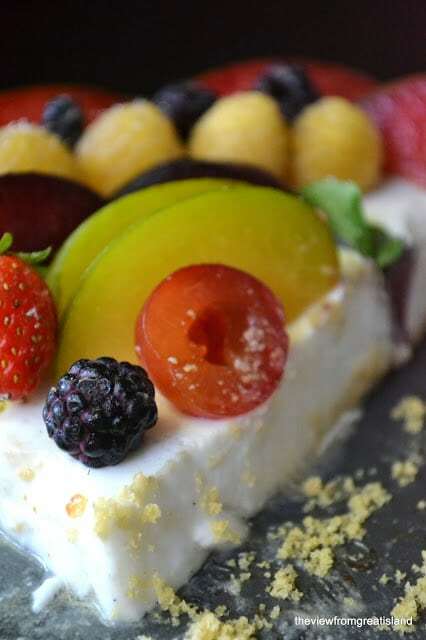 Arrange the fresh fruit on the tart shortly before you want to serve it and keep it refrigerated because the panna cotta will soften at room temperature. Make it vegan ~ use vegan crackers and coconut oil for the crust.